These modern bridal gowns are fashion-forward and are designed to give a woman confidence. They are ideal for those who want to stand out, turn heads and make a lasting statement. Bridal styles that revolutionise the cosmopolitan bride, Made for a woman at the forefront of fashion and unbound by traditional constraints. The label White April is from Cizzy Bridal Australia. Our stunning bridesmaids range have a bridal party look that is modern, trendy and matching. Be eclectic and mix and match your maids while creating a perfect harmonious colour scheme for the wedding. A great opportunity to get a glamorous dress for less and look amazing on your prom night. A lot of the bigger bridal shops have very similar, traditional style dresses. But you don't have to stick with these If you really want something a little bit different. 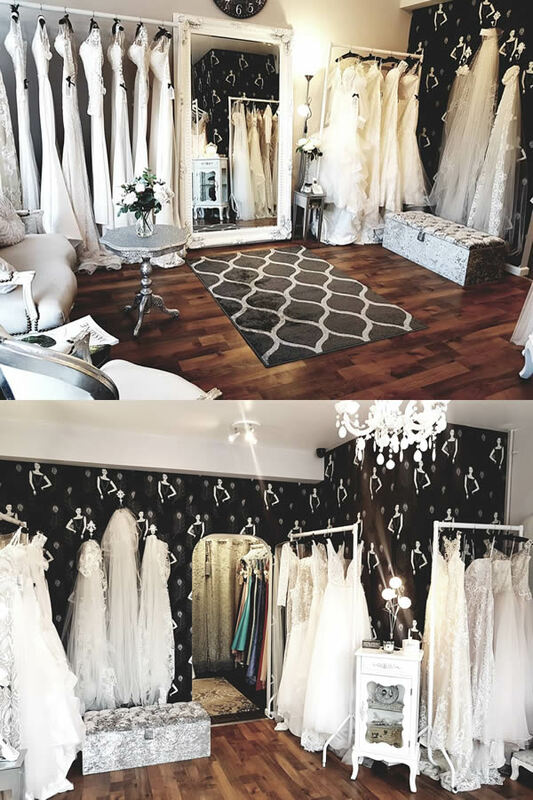 Visit Laima Boutique in Birmingham, West Midlands and you will discover our fashion-forward bridal dresses definitely stand out from many traditional designs. With prices ranging £1500-2200. We have truly beautiful styles from Dando London who are famous for their fitted bridal gowns and we are proud to be the only stockist of these dresses in Birmingham, UK. If you are looking for unique, modern boho wedding dresses with contemporary styling then why not come and see our new bridal collection from White April that have sleek, streamlined silhouettes. Or you might love our whimsical, romantic bridal gowns from Jasmine. The B2 and JB collections also from Jasmine are for bridesmaids looking for luxury styles. We also have a selection of dresses for your prom/party from designer labels Angela & Alison, La Femme, Elizabeth K and Intrigue which will make you feel like a celebrity! Laima Boutique also has an additional in-house high quality alterations service with years of experience making sure you get the perfect fitting dress that you deserve. Our stylish boutique has a selection of amazing bridal and bridesmaids gowns exclusive to Birmingham. Book an appointment and you just may find your dream dress! Fantastic place, not lots of dresses but well selected ones - we found the perfect wedding dress! Highly recommend this place and Laima was lovely. I purchased my bridesmaids dresses from Laima and was very impressed with the service and the quality of the dresses. Laima did the alterations quickly and perfectly and the girls looked amazing! This shop has dresses that are just in a league of their own! !